Following the publication of the new Telco 2.0 Manifesto, we’ve refreshed our overall strategy research programme for the coming year. (Like the fashion industry, our products change with the seasons.) This new programme will address the key strategic challenges that lie at the heart of creating new value in Telecoms and adjacent markets. Here’s a quick preview. 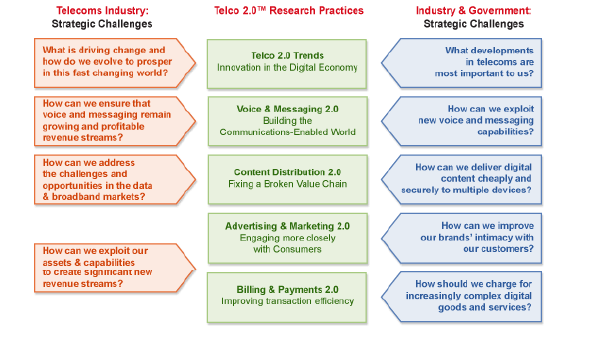 We’ve organized our research into 5 Research Practices to address the key Telco 2.0™ strategic challenges. Each report contains >150 pages of detailed analysis and insight, numerous case studies, reviews of winning and losing strategies, and short, medium and long-term action plans for Telcos, Vendors, Investors, and their business partners. Each year each of the Research Practices produces a package of 8 × 30+ page Executive Briefings that provides the very best leading thinking and real world learning across the subject area. It’s designed to keep leaders and strategists fully and comprehensively ahead of the game. The packages include direct access to Telco 2.0™ analysts. Please email Andrew Collinson, Research Commercial Director, for further information.